STANLEY ROBERTS (CHESTER) LTD has over 45 years experience in the Plumbing and Heating services industry. Based in Chester, within close proximity to major motorways, we are well placed to serve the whole of the North West and beyond if required. Take a look at the wide range of work we undertake on our Past Projects page. Whatever your requirements we are here to help. We also carry out sub-contract work for builders on a variety of projects, our employees are CRB checked and hold CSCS cards. Stanley Roberts (Chester) Ltd carries comprehensive public and employee liability insurance. Boiler room design and installations. 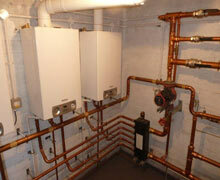 Gas, oil or LPG Boiler installation. Service and maintenance of all boilers. Repair and maintenance of all sanitary ware. Installations, service and maintenance of thermostatic mixing valves. Installation of multipoint and single point water heaters. The Department for Education and Skills (DfES) were insisting that anyone seeking work in a school be thoroughly vetted beforehand and all our employees are CRB checked. For all your industrial and commercial plumbing and heating requirements we offer a FREE no obligation written quotation.